Travelling to Chile meant fulfilling one of my childhood dreams: flying over the Andes. Packed with excitement, I somehow managed to sleep more than half of the long flight from Paris to Santiago. But instead of the Chilean capital, it was the pulsating harbour city Valparaíso that stole a big chunk of my heart. 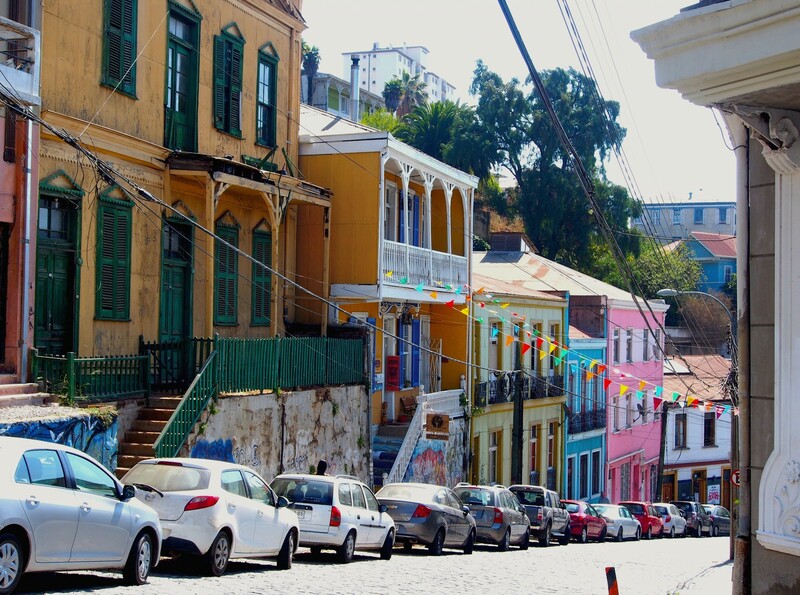 Colourful, vibrant, quirky, roughly beautiful… with Valparaíso one quickly runs out of adjectives. 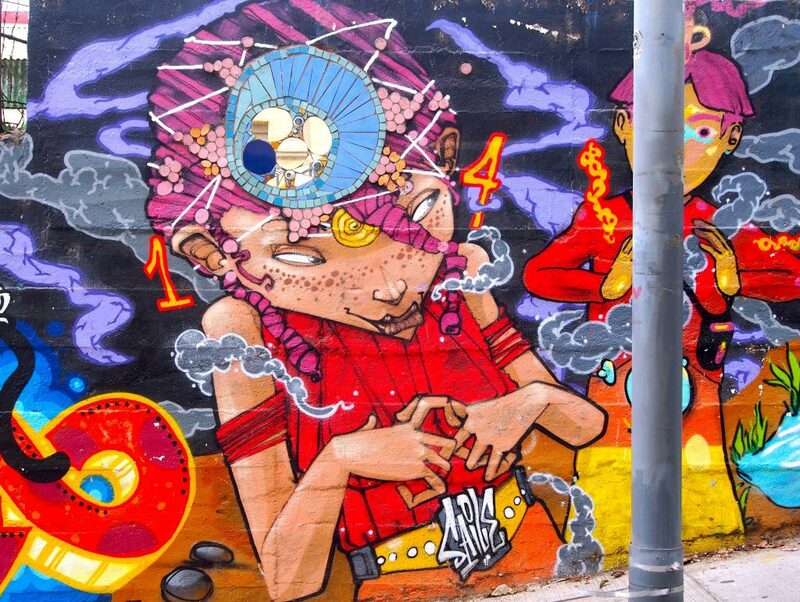 Spread amazingly over steep hills (cerros in Spanish) overlooking the South Pacific Ocean, the city is not only known as the Jewel of the Pacific and art mecca of Chile but also for its rampant crime rate. On the UNESCO World Heritage List since 2003, Valpo (as they love to call it) has attracted swarms of cultural entrepreneurs and artistic souls to dwell on its panoramic hills in the past two decades. No wonder it seduced me in a second. 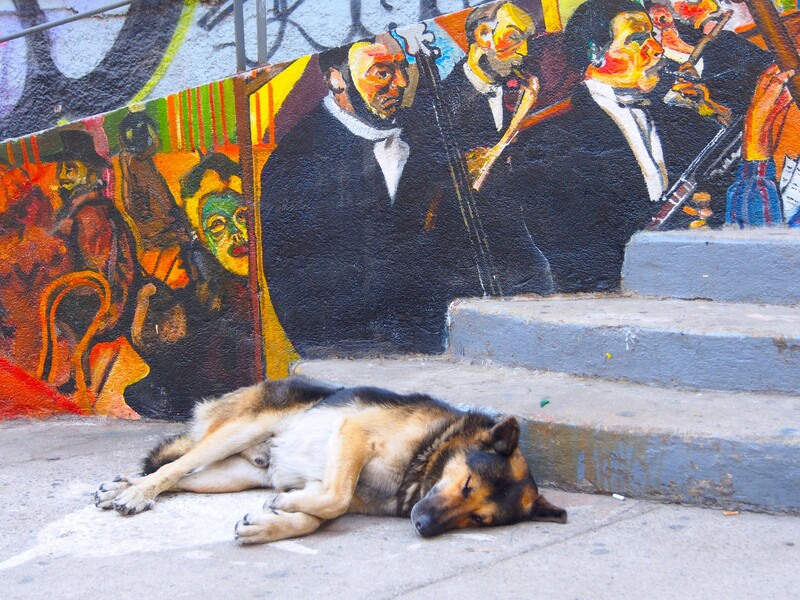 Although the amount of stray dogs broke my heart. I still see their sad eyes in my dreams. After our half-day trip to Valpo with Scandinavian wine professionals (thanks to Miguel Torres Chile for amazing days in the country and making us familiar with the indigenous País grape, about which I have written here), I was craving for more. So I returned to Valparaíso for my last days in Chile, confident to find my way without taking a look at the map. But choosing the wrong elevator on the plateau, I ended up on an obscure-looking little square where the locals told me to leave immediately. Still a newbie in town, I decided to listen to their wisdom. These old, wooden, squeaky elevators (funiculars) that take you from the sea level to the hills are among the most emblematic features of Valparaíso. Before going up, check carefully which elevator goes to which hill. 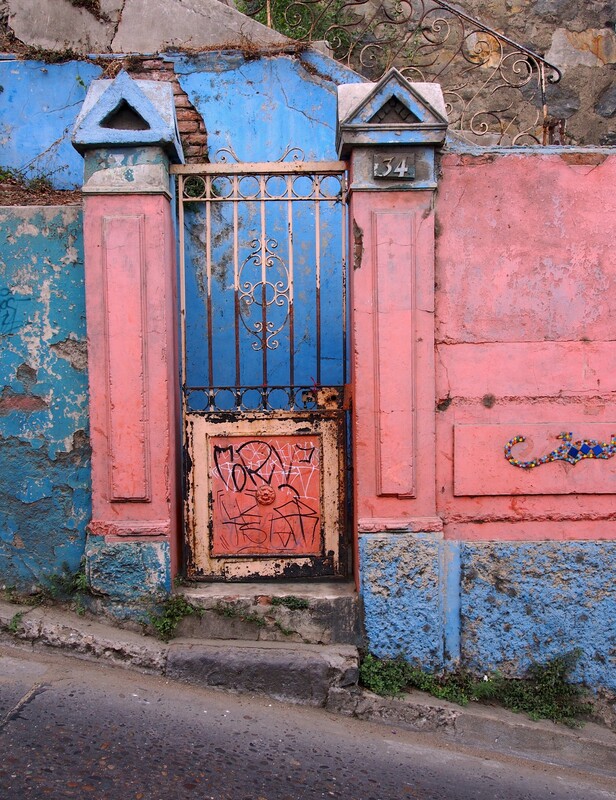 If you pick a wrong one, you probably need to come back down to the plateau since after the shrinkage of the funicular system, some of the cerros have remained aloof from others – and the narrow walking alleyways connecting them are perfect arenas for pickpockets. 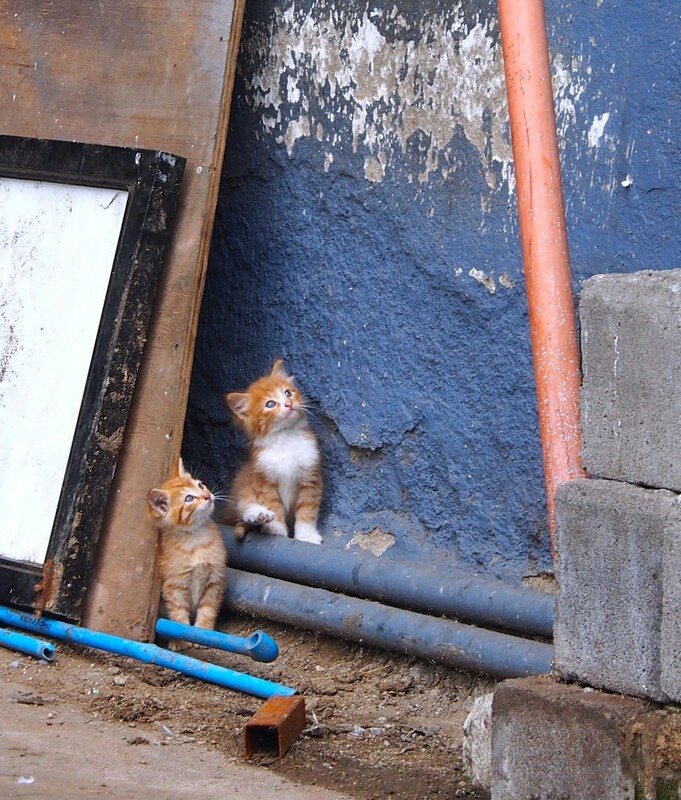 These innocent stray cat kittens, still unaware of their doomed destiny, broke my heart. I spent more than one hour watching them play. So far nowhere else have I seen so many street animals as in Valpo. Or try the classic Valpo trolleybuses that are the oldest still functioning trolleybuses in the world! Modern buses, in turn, are more efficient, and the network is comprehensive yet not all the slopes are reachable by bus. Besides, I prefer getting to know places by walking 15 to 30 kilometres a day while travelling by myself. Cerro Alegre during the afternoon break. 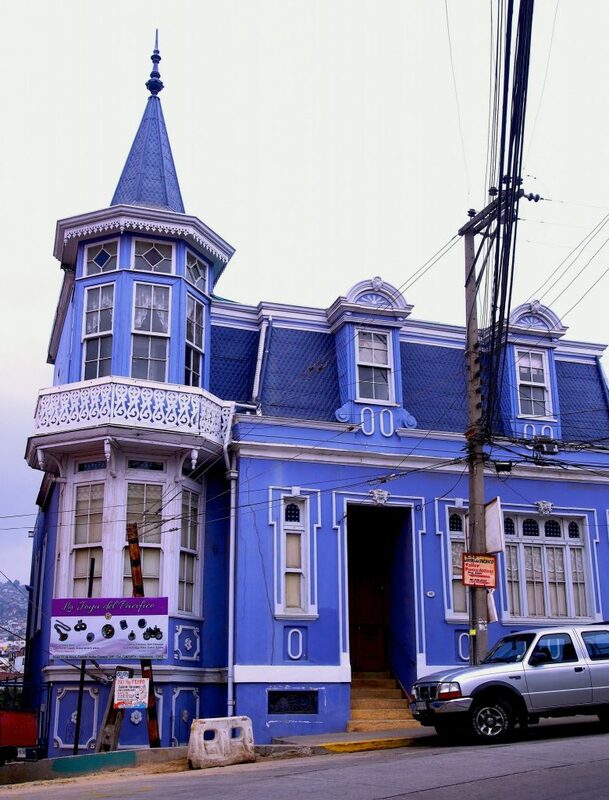 If you are the least bit into architecture, Valpo offers you unique construction culture with plenty of colourful corrugation iron houses (and shanties). During my walks I was warned many times about going further up on the hills. 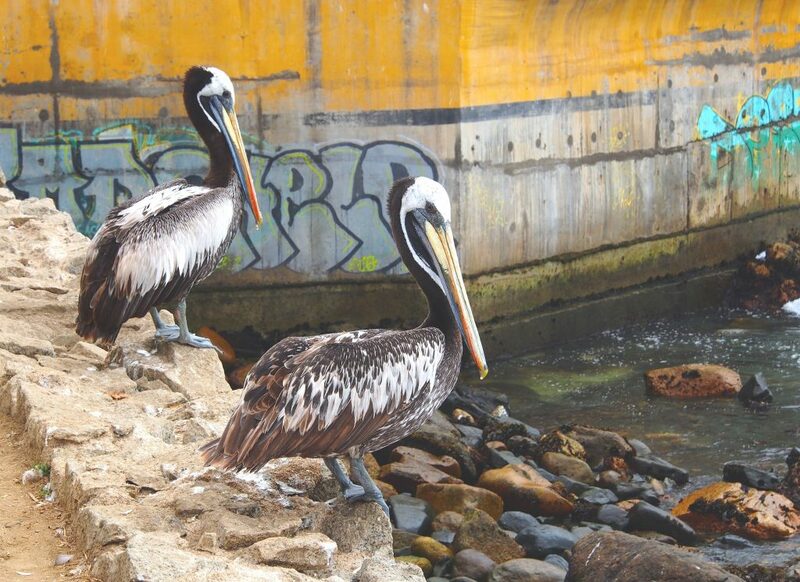 The locals surely knew what they were talking about, and having read stories of Valparaíso becoming the most dangerous of Chilean cities, I developed a true respect for their protective attitude. But with common sense and nonchalant Huckleberry Finn looks one can explore a lot in this magnificent city. Just avoid getting into the maze of upper Valpo alleys unless you have someone local with you. I did, and felt truly uneasy for the first time in my traveller life. This applies to many cities, of course, but what happened to me in Valpo is a glaring example. After messing up with the elevators upon my second arrival in the city, I opted for a taxi. A nice-seeming local guy advised me to grab an unofficial taxi and even negotiated the rate with the driver to 500 pesos instead of the recommended official fare – 1,500 to 2,500 pesos – for that kind of distance. In the end of the ride the bill was more than tenfold. But with very limited understanding of Spanish, dragging a big suitcase and not knowing much of the city yet, what can you do? It’s also true that many streets in Valpo are one-way and wildly zigzag, so even short distances by car may take time. Despite all this (plus the fact that the sum was anyway bearable compared to those crazy taxi fares we Finns are used to), my street-savvy solo traveller habitus suffered a severe blow. Not only safe and beautiful, both of these cerros are easy to reach from the plateau. 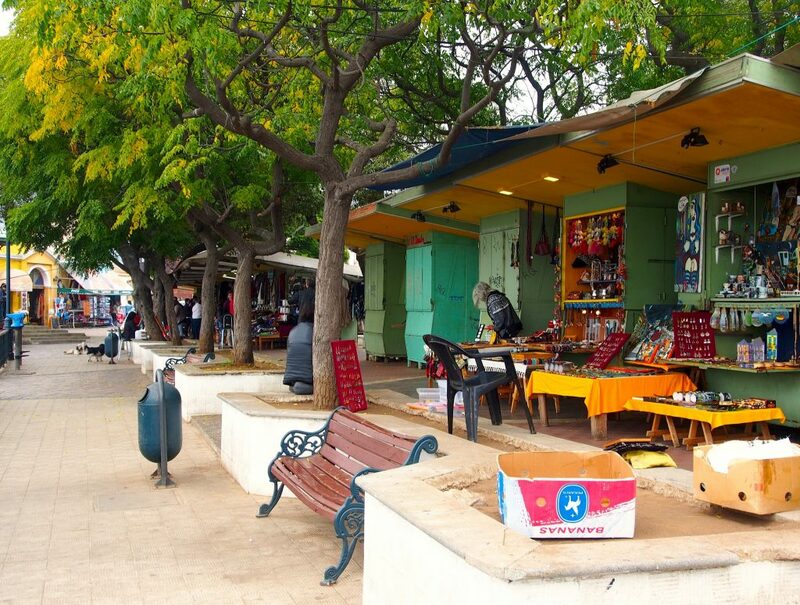 Especially if your visit is a short one and you wish to walk in peace while enjoying nice restos, cafés and bars, stunning graffiti as well as fascinating artesan boutiques in refurbished artsy surroundings, these are the first areas to explore. Gorgeous wall art in Cerro Concepciòn. 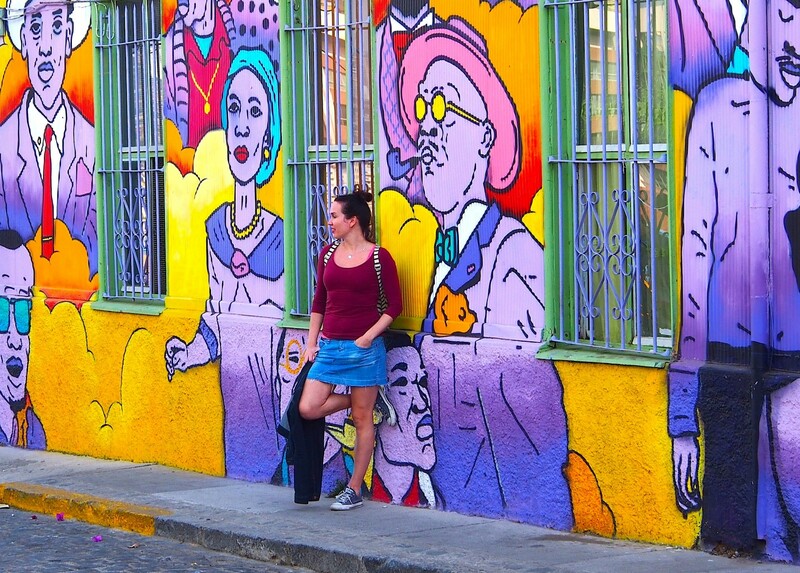 Based on my experience, Chile is not at all as cheap as neighbouring Argentina was three years ago (yes, lately this has changed a lot), but from Valparaíso you can easily find decently priced rooms. I booked mine only a day before my arrival. The location of Punto Cerro (not sure whether Diego still rents rooms because he had plans of selling the house and moving to France) turned out to be perfect: nice streets of Concepción and Alegre were just a stone throw away whilst the rooftop terrace offered stunning views to the harbour and hills. 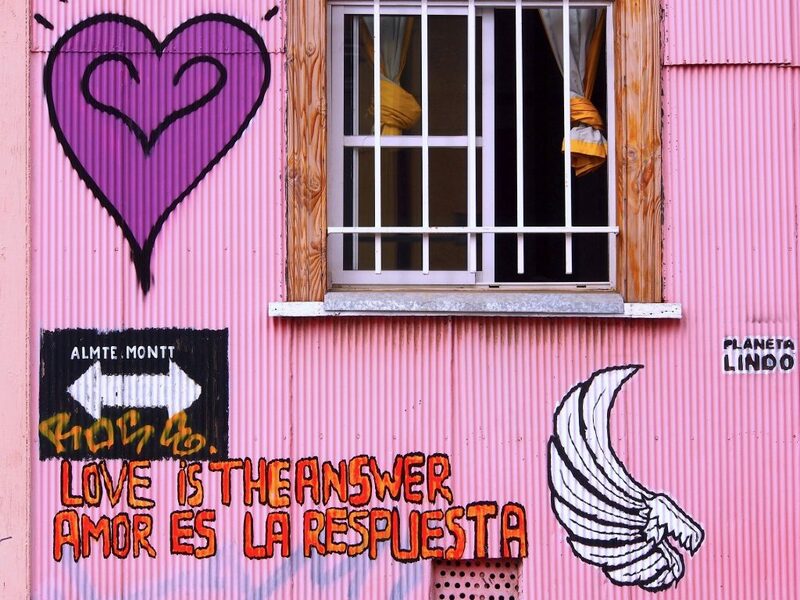 One thing is for sure: I will definitely go back to Valparaíso! 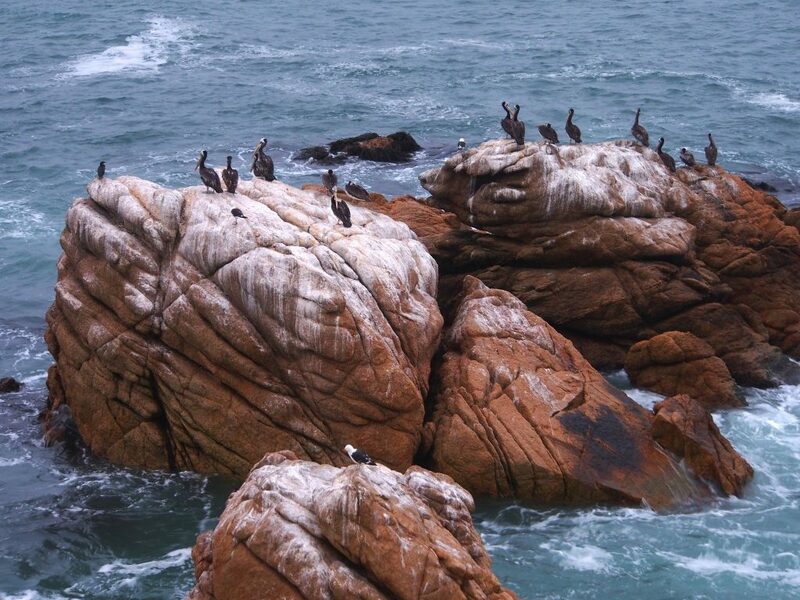 Thanks to its coastal location, Valparaíso is a true heaven for seafood lovers. I had ceviche every day and needless to say, did not regret a second. 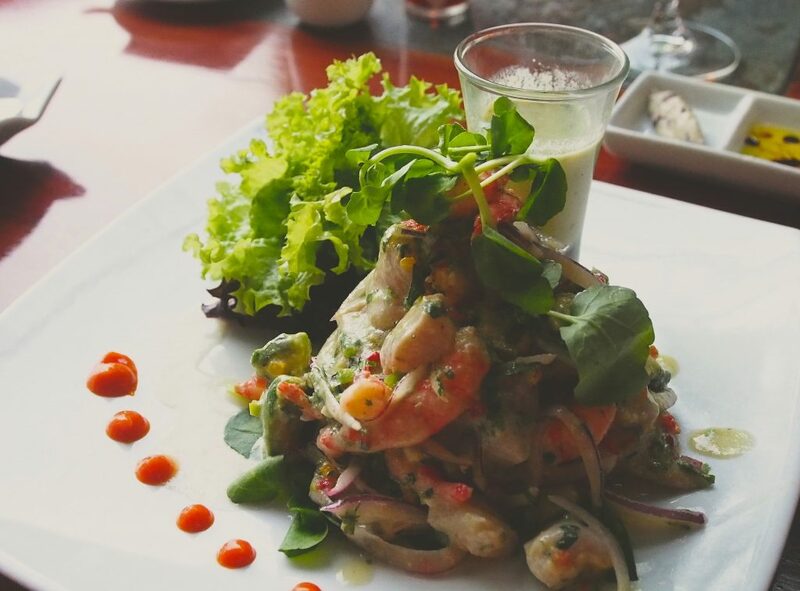 The fish is as fresh as it can get, and there are various interpretations of this traditionally Peruvian dish in Valpo restaurants, which makes eating a lot of fun. 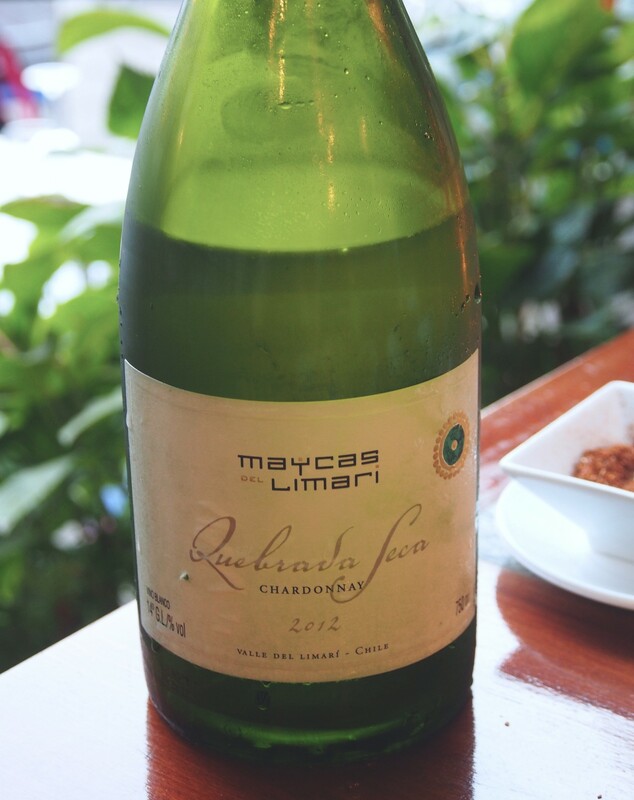 Oozing the charm of the old days, Café Turri offers wonderful views to the Pacific and a nice wine list in charmingly traditional setting. Even though the place is popular for afternoon tea/coffee and cakes, the ’café’ in its name is somewhat misleading as Turri has the widest menu I have seen in Valparaíso, including sophisticated and creative dishes for every taste. I still savour the memory of squid ink lasagne with scallops, succulent pork fillet in perky raspberry sauce… and a splendid meringue, fruit compote and butterscotch dessert (see the opening picture of this blog post). 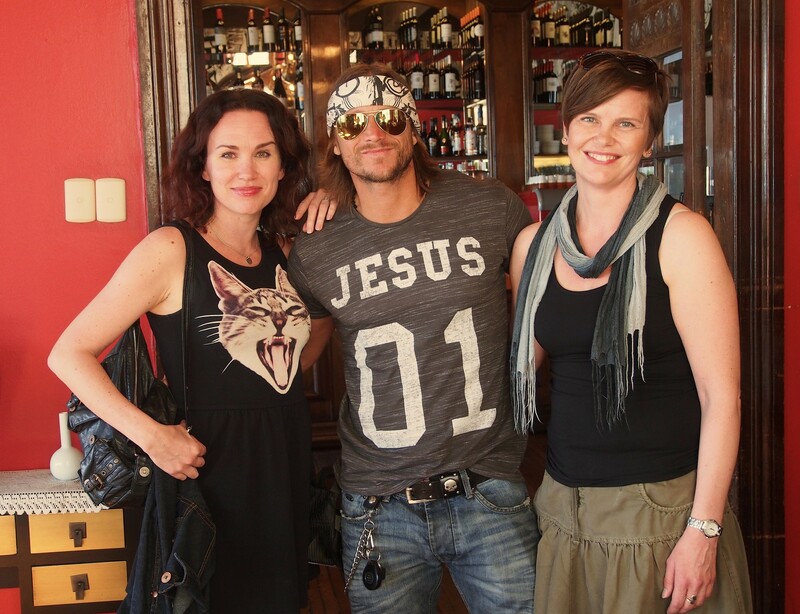 Me & Maarit with Santiago The Biker. I also love it that the terrace of Turri is covered with white table cloths. During our lunch warm breezes caress the coastline, and the sea is glimmering in all possible shades of blue. Even the waiter that seemed quite distant in the beginning gets more and more personal, ending up cracking jokes with us. Suddenly a big laughter is wafted from the table next to us. A bunch of bikers. Easy to approach, we end up chatting to one of them. His name is Santiago. And he’s “on his way”. Another nice place to wine & dine with seafood emphasis is Café Vinilo. 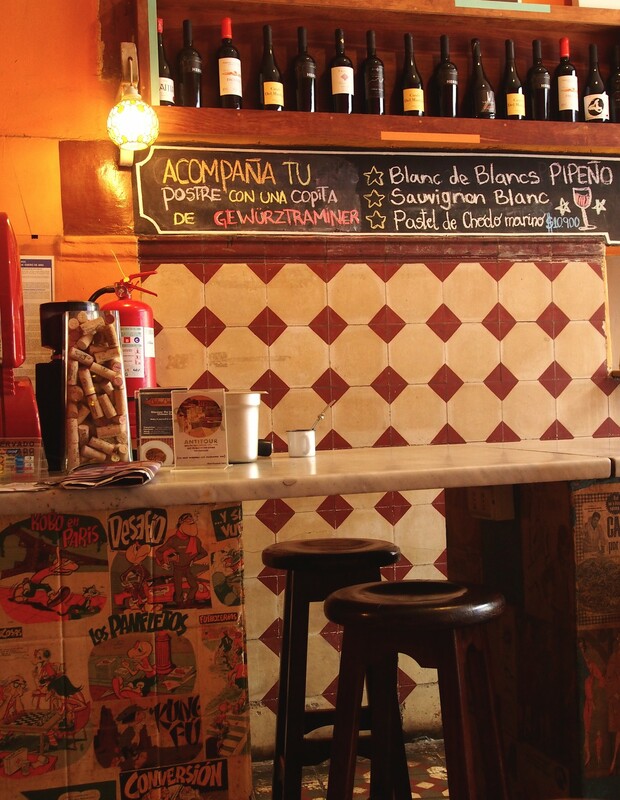 This unpretentious little spot has an intriguing wine list with many natural wines and some amphora-fermented Chilean wines, not to forget about great pisco sour! Hearty service and great soundtrack are a big plus. The morning mists in Valparaíso can be extremely thick and the weather remain surprisingly chilly until late afternoon. The nights as well were much colder than one would expect to be in autumnal Chile (I visited Valpo in the end of March), and the winds can be nasty. Valpo is not like the Azores where the weather seems to be changing every hour, but still be prepared to dress and undress throughout the day. A beautiful old house in Cerro Artillería. If you are short of time, take the elevator up to Cerro Artillería hill just before sunset (sorry, no landscape pictures as my camera run out of charge… and instead using pictures from the web, I prefer to present my own). The view is spectacular, and just next to the funicular there are traditional wooden kiosks where you can buy hand-made jewelry, other artworks and local delicatessen while watching the maritime traffic at the huge harbour of Valparaíso. 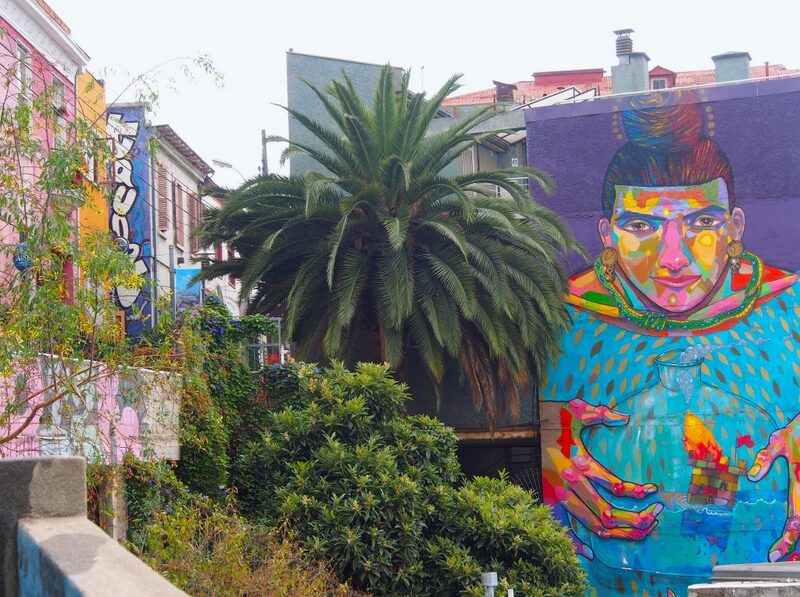 For catching a glimpse of shady neighbourhoods, neglected parks, poverty and junkies, just continue deeper into this cerro. I went, nothing happened, but in the evening my landlord was not very content hearing this. 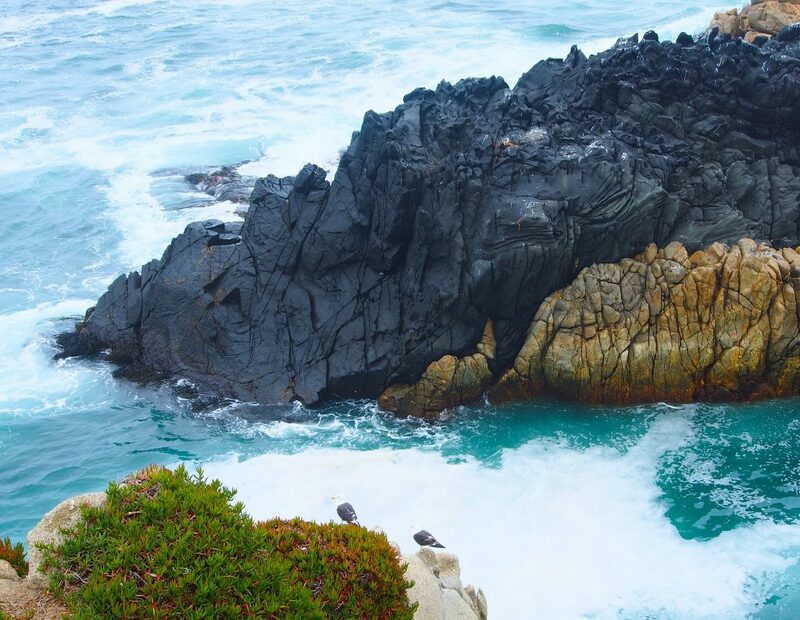 If you wish to dip in the ocean and have a break from the Valpo edginess, catch a bus to adjacent Viña del Mar, an integral part of Greater Valparaíso area. Neat, nice, modern and safe, this popular beach city is favoured by many Chileans living elsewhere. In my opinion, Viña offers enough to do for a day but definitely lacks the whimsical charm of Valparaíso. I felt more at home with another touristic hotspot, ConCón (appr. 15 kilometres north of Valparaíso). For anyone interested in seeing rocky landscapes, sunbathing seals and massive pelican gatherings, this is a place to be. ConCón also attracts sunlovers and outdoor people to walk on its dunes while offering excellent possibilities for windsurfing. My last evening in Valparaíso is very cold so I decide to stay nearby in Concepción. 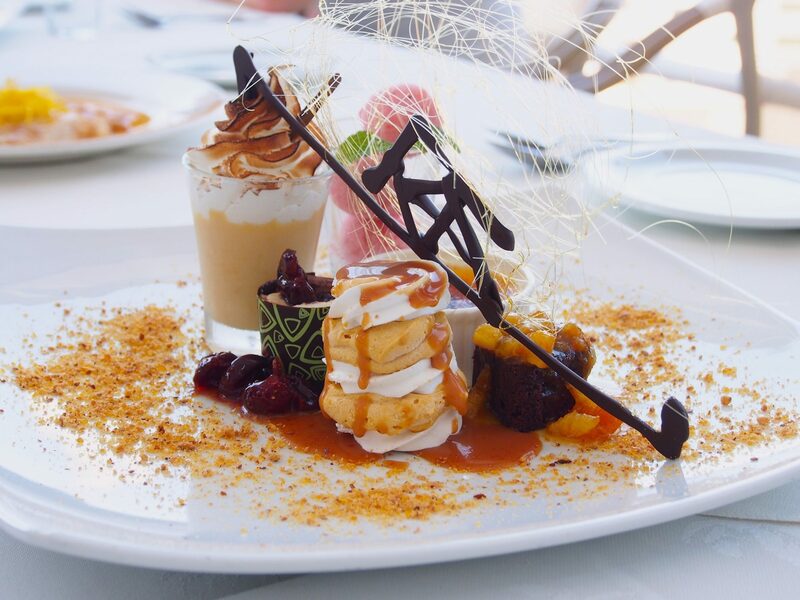 For the dinner Diego suggests La Concepción, one of the finest and best-known restaurants in the city with a big terrace offering terrific views to the Pacific. Coming quite early (many Chileans eat earliest from 21:00 onwards) the place is half-full but gets crowded as the evening goes by. To my surprise, even though La Concepción has approximately 50 various wine labels on their list, they do not offer many wines by glass. As if the waiter knew my thoughts, he suggests that if I want to order a whole bottle, I could enjoy some of it during the dinner after which they would be more than happy to pack the rest for me into a doggybag. Great idea! 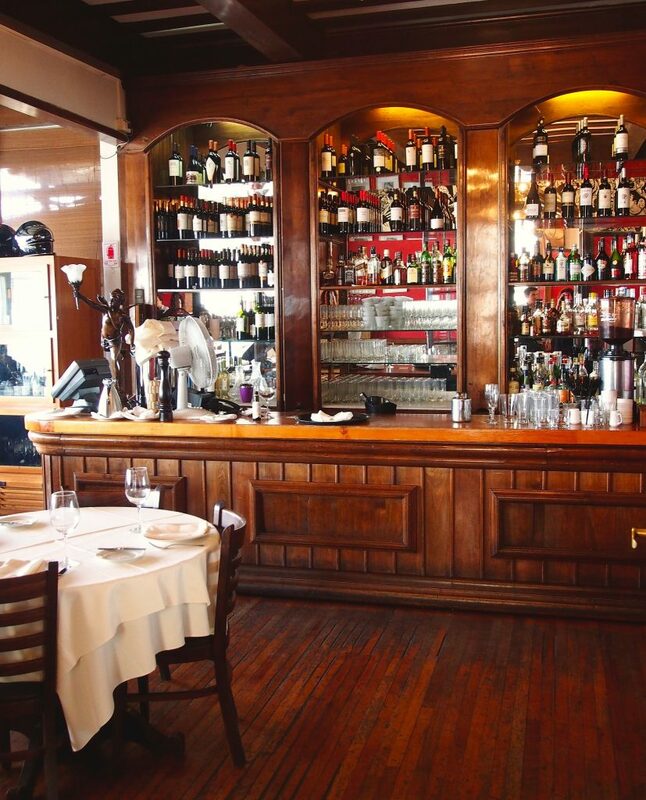 The food – made of local ingredients only – is tasty and the service is attentive to the smallest detail. As the evening gets colder, they bring me two huge woollen blankets so that I can continue dining outside. The first half of the bottle escorts my dinner, whereas the latter half would travel with me to Santiago on the following day. It will be enjoyed as an aperitif before seeing something lovely. Astonishingly lucky as I am, just a few days before the Chile vs. Argentina national soccer game I manage to buy a ticket from the web – and from a great spot at Estadio Nacional Julio Martinéz Prádanos (the Chilean national anthem was a great experience as my video shows). After some unluck and game day changes with La Liga in the past, on the other side of the world I finally get to see Messi play. Café Turri: Templeman 147 (Cerro Concepción). Mon-Fri 12:30–14 and 19:30–21:30, Sat 19:30–21:30. Tel: (56) 32 236 5307 & (56) 32 225 2091, or book here. Café Vinilo: Almirante Montt 448 (Cerro Alegre). Mon-Thu 09–01:30, Fri & Sat 09–02:30 and Sun 16–01:30. Tel: (56) 32 223 0665. La Concepción: Papudo 541 (Cerro Concepción). Tue-Thu 12:30–22:30, Fri-Sat 12:30–23, Sun 12:30–22. Tel: (56) 32 249 8192 or book here. It was; one of the best desserts ever!